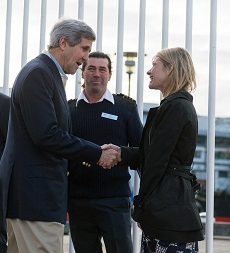 Jessica today had the pleasure of meeting the US Secretary of State John Kerry, whilst visiting the National Maritime Museum in Sydney, as she joined him with a group of school students on a tour of the Endeavour replica tall ship. During their meeting, It was evident the Secretary and Jessica had a lot of common, with the pair chatting about their love of sailing and passion for protecting the oceans. Jessica enjoyed talking all things nautical and briefly sharing her around the world experience with the Secretary. “Secretary Kerry said he had been sailing since he was 3 years old and grew up on the water, so he asked some questions about my around the world voyage,” said Jessica.